1941 Willys- CAR IS TITLED AS A 1941 WILLY HAS CLEAN PA TITLE. A classic, custom street rod with the right stuff! Ask any Hi end builder and they will confirm Outlaw bodies are the Best!!!! Show & go ready, well sorted and turn key dependable! Body and frame Beautiful Outlaw body mini-tubbed in classic black basecoat/clearcoat as smooth as glass with great fit and finish. Outlaw frame in gray - nicely detailed and all well done. Drive train - Engine is a fully detailed GM 350-4 Bolt Main, Comp Cam, Pete Jackson timing gear drive, 882 heads, roller rockers with dual 4-barrel chrome Edelbrock 500 carbs on a chrome Air Gap high rise manifold. The transmission is a 350 Automatic with manual valve body coupled to a Currie 9' Ford with 360 posi gear. The front end is Magnum drop straight axle. Rear is a 4 link with Eagle adjustable shocks on all four corners. 3' Flow master exhaust. It has an 18 gallon aluminum fuel cell, aluminum radiation with electric fans, etc., etc. The car rides on Centerline aluminum wheels 15x12 in the rear with 16.5 wide Mickey Thompson Tires. 15x6 on the front. Interior Very detailed full leather interior, including the headliner in grey with black accents by Portage Trim, with power windows, air conditioning that blows niceand cold, Stewart Warner gauges, IDIT tilt column, Lokar shifter and knobs, custom stereo system and more. This is a very well built car with excellent fit and finish that drives and rides great either around town or out on the highway. 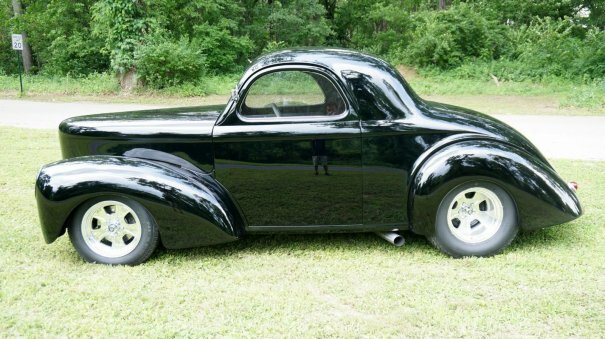 If you are looking for a very well built and well appointed '41 Willys that drives and rides great but doesn't cost an arm and a leg this is it.